The roll-out of a revolutionary meningitis vaccination in Burkina Faso, Mali and Niger has dramatically cut transmission rates, according to the World Health Organization (WHO), and if each country can find sufficient funds to co-finance the campaign, it will be extended to all 25 countries in the Africa meningitis belt by 2016, says the Global Alliance for Vaccines and Immunization (GAVI). 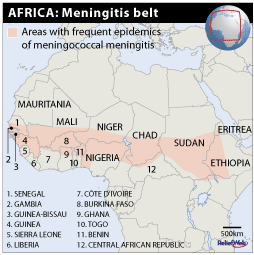 In the 2010-2011 meningitis season, Burkina Faso has confirmed just four cases of meningitis A; Niger has reported four cases; and Mali none, according to WHO. While in Burkina Faso everyone in the 1-29 age group was vaccinated - representing 70 percent of the population - Mali and Niger are doing phased roll-outs over a longer period. Group A meningitis causes deadly epidemics every 8-10 years in the Africa meningitis belt, where 430 million people are said to be at risk, according to WHO. Meningitis is an infection of the brain lining that kills up to 10 percent of people who contract it. Residents of Burkina Faso capital Ouagadougou told IRIN they were surprised by the results. “Even though we were vaccinating our children we did not believe it would be this effective,” said Alexis Kabore, whose daughter contracted meningitis in 2004, leaving her paralyzed. “We have not heard the same [mourning] cries that we are used to hearing during the meningitis season,” he said. Under the current agreement, GAVI purchases the vaccine, covering 50 percent of the campaign costs, while individual countries are expected to cover the other 50 percent - including transport, training and storage costs. The vaccine, produced by Indian company Serum, currently costs 49 US cents per dose. The campaign will next reach out to Cameroon, Chad and Nigeria, followed by Benin, Ghana and Senegal. Once the campaign is complete, health ministries are expected to include vaccination in routine campaigns, said Mercy Ahun, managing director for programmes at GAVI. Costs of producing the vaccine were significantly reduced under the Meningitis Vaccine Project (MVP), a partnership between PATH and WHO, which brought costs down to less than one tenth of the US$500 million usually required to develop and bring a new vaccine to market. Nevertheless, some $375 million is still needed for the roll-out of the campaign across the meningitis belt, said WHO’s MVP focal point, Mamadou Djingare. While some countries have raised the money they need, others are still falling short, said WHO focal point for the project in Geneva, Tevi Benissan. GAVI just raised US$4.3 billion at a pledging conference in London. While the new vaccine is more effective than previous ones because it is expected to protect people from the disease for significantly longer - and it protects children as young as one year old - there is no vaccine yet available for infants, said Ahun. An ongoing trial in northern Ghana, in association with PATH is expected to ascertain what dosage levels and at what intervals the vaccine should be safely administered to infants, and once finalized and approved by regulators, should be available by 2013, said Ahun. WHO’s Benissan told IRIN new producers should be sourced as the vaccination becomes routinely available, to avoid production shortfalls. Despite challenges, “the MVP should be taken as a model to develop other meningitis vaccines, and vaccines for other diseases, so they are reasonable and widely available,” she said. Next steps for the project include trying to develop an equivalent vaccine that can fight against meningitis Y, C, AW135 and X. In 2009, meningitis infected at least 88,000 people across sub-Saharan Africa and led to more than 5,000 deaths.